Buildings are ready to be smart — we just need to collect and monitor the data. Buildings, like people, can benefit from lessons built up over time. Just as Amazon.com recommends books based on purchasing patterns or doctors recommend behavior change based on what they’ve learned by tracking thousands of people, a service such as Clockworks from KGS Buildings can figure out that a boiler is about to fail based on patterns built up through decades of data. I had the chance to be enlightened about intelligent buildings through a conversation with Nicholas Gayeski, cofounder of KGS Buildings, and Mark Pacelle, an engineer with experience in building controls who has written for O’Reilly about the Internet of Things. In the past (and still too much with us now), heating and air conditioning equipment was monitored and controlled by building automation systems that required detailed trending and manual analysis to assess a building’s performance. In the present, systems can aggregate and automatically analyze the data to produce prioritized information for decision makers. In the future (just beginning to appear in early adopter homes), pervasive control and intelligence will propagate into residences while optimization and self-correcting systems will be used in large buildings. For most of the Age of Electricity and of central heating, no one tracked the consumption of a particular piece of equipment. Building automation now allows a facilities manager to control and monitor particular equipment and systems, automatically adjusting the timing and amount of heating delivered. Log files provide a view over time that can uncover degrading equipment. KGS Buildings builds further on the services provided by building automation vendors. Running its Clockworks PaaS service on Azure, it analyzes data collected from building automation systems to detect and diagnosis faults and opportunities for efficiency. KGS applies a system drawing from a 40-year-plus history of learning on fault detection for heating and air conditioning. Analysis can reveal a hidden problem in a valve that is not fully closing and thus causing excess heating or cooling — a problem that no one might notice because the temperature is still OK, as the system compensates for the flaw. The system can also find opportunities to improve control, such as detecting that heating systems are not operating at their most efficient condition and suggesting how to improve its control. A system like KGS Buildings’ can also go beyond adjustments to suggest new capital projects. For instance, it might suggest adding a variable speed drive to make cooling systems more efficient. These are classic examples of computerization maximizing human expertise: you can get quick results from automated analytics instead of waiting for a consultant to read through all the logs from your equipment. Overall, this allows knowledgeable engineers to spend less time identifying and more time fixing problems. The library of diagnostics can also be customized for individual buildings, which is important because every site is different and has very different constellations of equipment. The raw data is available to KGS Buildings because they securely read from building automation systems and post that data to the Azure cloud for analytics. Building automation systems employ a wide variety of communication protocols, with predominant common standards such as BACnet, oBIX, OPC and Modbus. A few automation systems have proprietary interfaces that KGS Buildings has to code to directly. Other companies in this space include SkyFoundry, SCIenergy, Ezenics. 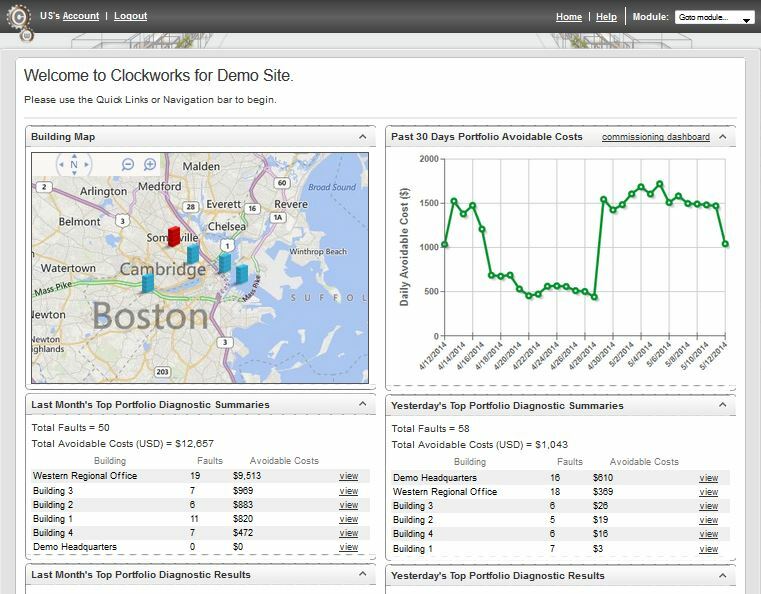 Identifying and prioritizing faults or out-of-spec operations in a building’s energy management infrastructure, possibly preempting costly and uncomfortable downtime. Recommending adjustments to the existing equipment and more efficient operation to save energy and/or increase comfort. Recommending equipment upgrades or modifications that require a capital expenditure to save energy, lower operating expense and improve comfort. It’s difficult to develop a company in this space because many building managers — and the financial decision makers controlling their budgets — are still not alert to the value of energy management, despite the enormous potential savings and public concern over carbon emissions. Perhaps the biggest hurdle is the division of responsibility for facilities among many managers and cost centers. The person responsible for maintaining the HVAC system may be different from the bean counter tasked with holding down costs. In many buildings, costs are divided among tenants, and no single tenant will save enough to make it worth their while to invest in automation and monitoring. Currently, institutions showing interest in automated fault detection for buildings include health care providers, laboratories, large commercial real estate, and universities. K-12 schools, retail outlets, and hospitality are just beginning to dabble in it. Pacelle noted that energy utilities are getting interested in sophisticated analytics as part of their need to control demand. Many utilities already offer incentives to detect faults in order to drive energy efficiency. Gayeski is looking forward to the increase in data that the Internet of Things will provide, enabling deeper and more informative analytics. At that point, the smart grid will reach out to individual home owners as well. The potential was highlighted in a recent White House expo on “cyber-physical systems.” Consumer products can be seen in the stores, but are currently expensive, as one would expect in the phase before mass consumption. Pacelle summed up the change in building management: “Value is now in the data, not the device. The ability to collect data from more devices (e.g. thermostats, occupancy sensors, etc. ), and more building equipment (e.g. HVAC equipment, boilers, air handlers, etc.) will provide a higher resolution of information and an opportunity to see exactly how the building and its equipment is performing.” Anyone wanting to manufacture or sell building equipment should think of ways to store data in the cloud and exploit it for better operations.